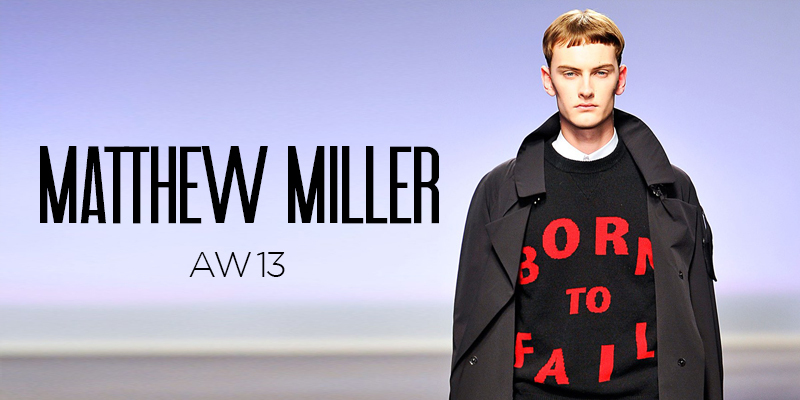 "A New Revolution" was at the core of Matthew Miller's Autumn Winter 2013 collection. Staged in the cavernous interior of the Old Sorting Office he sent his models out in shades of black and slate. Brief flashes of red echoed the anarchy and rebellion of a discontent generation. Miller used the slogan "Born To Fail" as a metaphor for the current state of society and the disparity between Generation X and Y. The slogan was seen emblazoned on sweatshirts and expertly stitched onto jacket sleeves. There was an air of precision in the tailoring and overcoats that reminded me of uniforms. The show notes talked about taking the uniforms of Generation X and re-purposing them for "a displaced Generation Y." 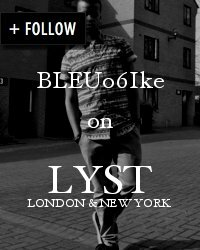 An idea that is very much on trend when you look at the youth of today. Personal highlights included the gradient knit jumper, the crocodile embossed biker jacket and the army issue styled luggage, a collaboration with H by Harris. I also loved the shoes, which were a collaboration with Timberland. Matthew created exclusive custom made footwear that featured the red and black accents from the collection. Matthew Miller presented a collection that was more commercial than his past efforts (who can forget the gorgeous grafitti print suit from AW12?) but didn't compromise on the depth and high standards that he is known for.